During February 2012, a salvage excavation was conducted in the western part of the Beit Hanina neighborhood in Jerusalem (Permit No. A-6415; map ref. 220983–1019/637646–702), prior to construction. 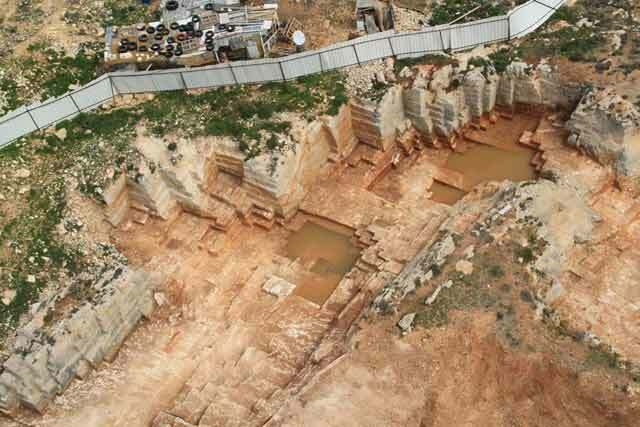 The excavation, undertaken on behalf of the Israel Antiquities Authority and underwritten by Abu Omar Aiyman Zoheir, was directed by I. Zilberbod, with the assistance of N. Nehama (administration), A. Hajian and M. Kahan (surveying and drafting), A. Peretz (field photography), the Sky View Company (aerial photography) and I. Berin (plans). Two adjacent quarries (K, L; Figs. 1–3) were exposed; they extend across a large area, high on a hill where maleke type limestone was hewn. The level of Quarry K was lower than that of Quarry L and the rock-cutting in both of them was done to a considerable depth (3–5 m). Two excavations were conducted nearby in the past, revealing quarries from the Late Roman–Early Byzantine periods (HA-ESI 124; A-6324). Several other quarries dating to the Byzantine period were exposed north of the current excavation area (HA-ESI 119; HA-ESI 120). Quarry K (Fig. 4) extended across a slope, 4.5 m lower than Quarry L. About a third of the quarry’s area (c. 10×30 m) was excavated in its northwestern part. Its southern and eastern sides were situated beyond the limits of the excavation area. Five to seven quarrying steps (depth c. 5 m) were hewn in its western side (L203). Signs of modern drilling (diam. 2.5 cm, depth 1 m) for inserting explosives were discerned in the upper part of this side. As many as five quarrying steps were hewn in the eastern side (L208). 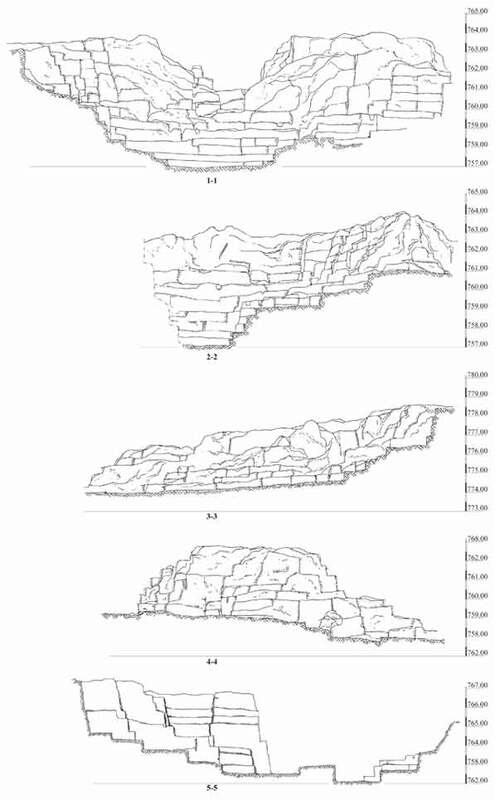 Numerous signs of rock-cutting and stone separating (dimensions of stones c. 0.4×0.5×1.0 m) remained in the stepped bottom of the quarry. Broad steps (L201, L202) hewn in the northern part of the quarry were probably meant to facilitate access to the adjacent quarry. Quarry L (Fig. 5) was divided into four units (L1–L4) for the purpose of excavation. The quarry’s southern part (c. 12×50 m) was excavated, whereas its northern part was located beyond the limits of the excavation area. 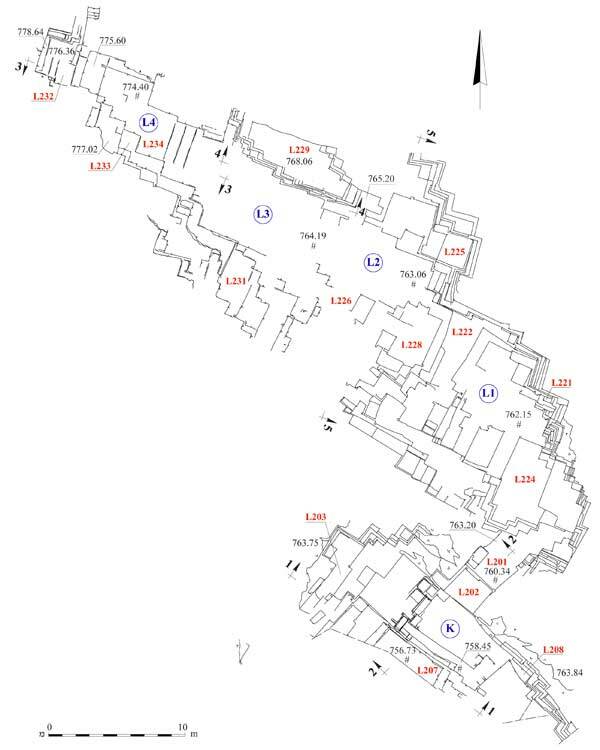 As many as twelve quarrying steps were hewn in the eastern (L221) and northern (L222) sides of Unit L1 and as many as eight quarrying steps (depth of the step c. 0.4 m) were hewn in the southern side of this unit (L224). Unit L2 was 1 m higher than Unit L1 and it became wider toward the north. Up to twelve quarrying steps were cut in its eastern side (L225). The negatives of the stones (dimensions c. 0.4×0.5×1.0 m) that were hewn in and detached from the quarry remained visible on its bottom (L228). An especially large stone (L226; 1×1×2 m) was exposed in the center of the quarry. A prominent bedrock mass (L229; 3×4×7 m) surrounded by deep rock-cuttings was exposed in the middle of the quarry in Unit L3. Up to six quarrying steps were exposed in the southern side of this unit (L231). Unit L4 was completely exposed where as many as nine quarrying steps were hewn in its western side (L232). The lower part of two–three quarrying steps were preserved in the southern side of this unit (L233), while modern drillings (diam. 2.5 cm, depth 1 m) were found in the upper part. Three separating channels (L234; length c. 3 m, width c. 5 cm, depth c. 0.1 m) with two parallel strips of bedrock (width c. 0.9 m) between them were exposed at the bottom of this unit. The height of the quarrying steps, the quarrying negatives of the detached stones and the separating channels indicate that similar size stones (average dimensions: 0.4×0.5×1.0 m) were hewn in Quarries K and L. Fill consisting of soil and stone fragments containing several potsherds from the Late Roman–Early Byzantine periods was discovered on the bedrock at the bottom of the quarries. 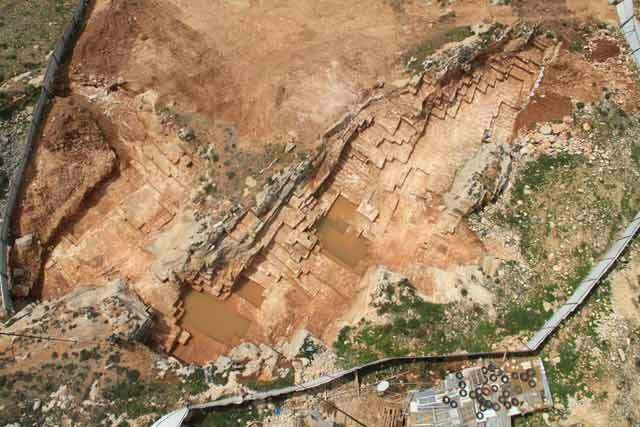 The quarries revealed in the excavation are part of a large group of quarries that were spread over a large area in the north of Jerusalem and provided the city with building stones from the Early Roman period until the present. 3. Quarries K and L, looking west. 4. Quarry K, looking north. 5. Quarry L, looking northeast.